24 year old Camry Phetvixay was born and raised in Fresno, California. Her mother is from Pakxan and her father is from Sum Neur, Laos. She graduated in December 2013 with a Bachelor’s of Science in Business Administration, with option of International Business from Fresno State University. Camry began SkyWest Airlines Inflight Ground Training in Salt Lake City, Utah on May 1, 2014 and continues her on-the-job training high in the sky. I have trips mostly every week with 2 or 3 days off (or sometimes just one!). These trips are can either be a local 1 day, 2 days or up to 4 days. I am based in Fresno, where Skywest mainly flies domestic and some international trips to Canada, Mexico and Bahamas. 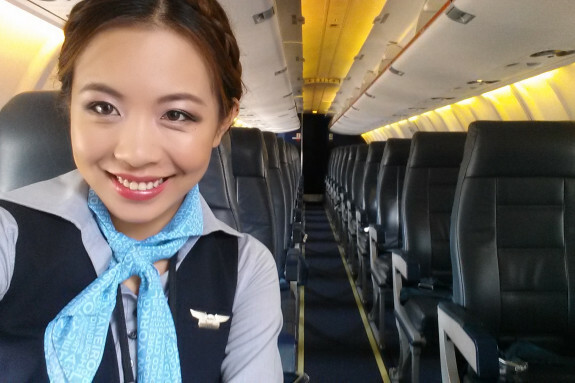 Our aircrafts only require 1 or 2 flight attendants onboard. SkyWest also flies for different carriers, including United, Delta, US Airways, Alaska, American Eagle. Just take a look at your boarding pass, and check the operator of that flight to know if you are on a SkyWest plane. Wednesday 9/10: Day Off. On most of my days off, I just like to relax at home. Most of the time I sleep in. Once in a while, catch up with some friends and enjoy a day out going to movies, having dinner, etc. I squeeze in some karaoke time. Most importantly, it’s my day to do laundry to get my uniforms cleaned! I usually pack the night before trips. Thursday 9/11: I start a 2 day trip for my Initial Operating Experience (“IOE”) on the EMB 120 Brasilia aircraft. It is a 30 passenger aircraft that I need to get qualified on with a lead instructor present before I am certified to take on EMB 120 trips alone. On this day, I had 4 legs (a leg is a flight from one city to another) on United Express. Our breaks between the legs are not very long, usually 30 – 40 minutes a turn before the next leg. This gives us enough time to clean up the aircraft, get it stocked, and eat a small snack. Depending on how much time we have before the board time, the crew may take a short lunch break. Here are the legs for day 1 of this 2 day trip, including miles and flight time. These flights include a full beverage service. Although these flight hours total about 5 hours, in reality it was almost 8 hours of duty for me. I reported at 6am and was released at 2pm. This concluded with a 19 hour layover in Monterey, California with a report of 10am the next morning. I took this opportunity to meet up with a close friend of mine who took for me out for dinner. Sometimes the crew would meet up for dinner too if they’re available. It’s a great chance to socialize and get to know one another. Or, sometimes crew members pack their food on trips. I would only pack food if I get into a city really late with an early report the next morning, because I know I would get hungry at night. Friday 9/12: It is always a great feeling to return home to Fresno. After every trip series, we always end up in our bases. We always start at our base and end at our base. I finished my IOE line check on one leg (this was a San Francisco to Santa Barbara leg which was 262 miles and 1 hour and 19 mins flight time). It was a short day for me due to the training. Saturday 9/13 and Saturday 9/14: Days Off. Time to wash my uniforms! Monday 9/15: I start another 2 day trip where I worked a roundtrip United Express flight from Los Angeles to Portland, Oregon and back (834 miles, approximately 2 hours flight time) and ended with an overnight in Los Angeles. The 2 legs alone puts me at 6 hours on duty. I ended the night with Korean food and karaoke afterwards in Korea town with a friend. Tuesday 9/16: I return home to Fresno from Los Angeles. I am grateful to be standing here today; to be part of the SkyWest family. The best feeling is seeing my family and friends happy for what I do!